Highly responsive and addictive drag racing game with many different cars and upgrade features. Gameplay: Drag Racing brings back memories of when Need for Speed first came out because it’s a lot like the drag race side game. The NFS side game was almost there for teaching people to gear change efficiently, so there was minimal driving and the focus was on testing your car’s brute power combined with your well timed gear changes. Drag Racing is quite similar, but it doesn’t have any driving in it, and the graphics layout is different. The core of the game is simple: press the accelerator pedal to signal that you’re ready. When the girl in the middle waves her flag, then the race starts so press the accelerator again to start the car off. Once the car is moving it’ll automatically accelerate so you don’t need to keep your finger on the gas pedal. Instead you focus on the car speedometer and tap the gear up button to continue driving faster. Just like in Too Fast Too Furious, there’s a cool Nitrous Oxide button to boost your car. Each round is very fast and is over in about 20 to 30 seconds. So it’s fast to get into the game, and it’s fast to play – so now you’re thinking “where’s the addictive element?” Well this is found in two parts. The first part is weaved into the gameplay mentioned above. Amongst the simplicity you need to get all your timings correct to get your start game launches, perfect gear changes and to maximise on your NOx. The aim is to beat the opponents to the finish line because then you win more money and respect points. The money and respect will let you buy components for the car so it’ll go faster. The second part which makes you come back to play is the depth of the game. There are 10 levels of cars and race categories. Within each category, there’s either a quarter or half mile race against Beginners, Amateurs, Pros or the Boss. So you keep playing because your competitive spirit spurs you on to try and beat all the race types on the different levels. 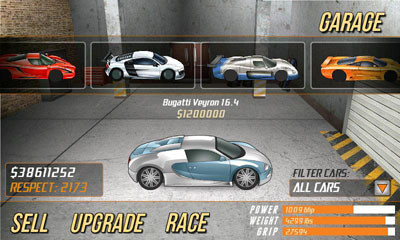 One of your final rewards is that you get to say you own a Bugatti Veyron – nice. Speed Rushes: Initially when I looked at the game I was quite doubtful that I would enjoy it. But as I raced more and more, I realised that the developers had captured the core elements of the drag race and put it in your pocket! The game feels really responsive – I’m not entirely sure how they did this, but it feels like the car launch and the gear changes require precision timing and control. Even though the graphics are slightly on the cartoony side, it’s still satisfying when you just pip your opponent past the line. The sounds effects are noticeable different so you can hear the different types of gear changes between the standard car and your turbo cars. I was slightly concerned that the improvements I had selected for my car might put me into a race category where I would lose too much. But you can sell parts if you find that. Also, it seems like there’s always a race type that you can win, so if you’re not beating people, then you can play the easy races to accumulate money and respect points. Verdict: 4/5 Awesome time killer, and I think I’m gonna keep this on my phone because the memory footprint is only half a megabyte. I’m nowhere close to buying the Ferrai Enzo or the Audi R8, so I think this game might have me hooked for days. I haven’t given the game 5 stars because of the graphics and the gameplay can be repetitive eventually. I know I’ve mentioned Need for Speed above, but don’t expect graphics of that calibre. Overall, the graphics theming and polish is good though. Obviously the game isn’t for everyone, I’m sure there are people who would find this a meaningless waste of time, but give it a try and see if you like it. If you’re a beginner and you want game tips, then check out our hints and tips page. If you’re an intermediate player and you want good car setups, then check out our optimum upgrades page. 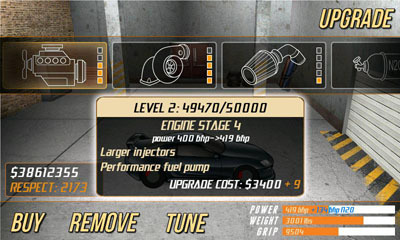 If you’re an expert player and you want to tune your car, then check out our tuning tips page. I think all the details are held on the phone… I tried moving the details over from my old phone to my new one but couldn’t back then. So, sorry… can’t help you on this one. By the way, assuming that your old phone is significantly worse than your new one… you may want to keep playing on the old one as it should theoretically be slightly slower and thus give more time to control the car. It sounds odd that the server was down. I’ve never seen that case, but I guess they may have been doing something on the servers. Please goto our Facebook Page to see upgrades and tuning for that car.